Xcel Xplorer Fullsuit 3/2 Wetsuit - Men's. 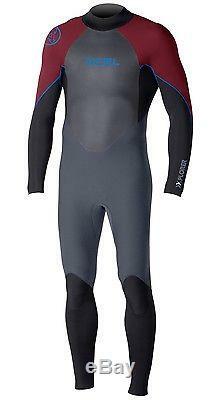 Men's XCEL Surf Wetsuit. The Xplorer is a durable, warm, and comfortable fullsuit and very easy to get on and off, thanks to the OS offset back entry that keeps pressure off your spine, especially when paddling. The upper body features premium UltraStretch neoprene for maximum flexibility. All seams are glued & blindstitched. OS - Smarter offset ("OS") back entry design keeps the zipper off the spine to reduce pressure and increase flexibility and comfort; with glued and blindstitched zipper flaps and a reinforced zipper base. Ultrastretch Neoprene - Comfortable, lightweight neoprene with softer foam and a tighter weave textile for less water absorption and better durability. Texture Skin - Texture embossed rubber that provides excellent wind resistance; ideal for outer chest panels hoods, and other areas that would otherwise lose warmth quickly. Glued & Blindstitched Seams - A fully sealed, maximum stretch seam construction that keeps water out. Neoprene panels are glued and pressed together, then blindstitched (needle doesn't fully penetrate neoprene, keeping water out). Less Seam = More Stretch - Smarter product design means minimizing seams to maximize stretch. Any seams used are always pre-bent and contoured for a truly engineered fit. DuraFlex Knee Panels - Contoured, durable panels that stretch with you. Recommended Water Temperature - 56-64 degrees Style # MX32SLX6. The item "Xcel Xplorer Fullsuit 3/2 Wetsuit Men's Medium, Graphite/Black/Merlot" is in sale since Thursday, May 04, 2017. This item is in the category "Sporting Goods\Water Sports\Wetsuits & Drysuits\Wetsuits\Men". The seller is "seatoski" and is located in Freeport, Maine. This item can be shipped to United States, Canada, United Kingdom, China, Mexico, Germany, Japan, Brazil, France, Australia, Denmark, Romania, Slovakia, Bulgaria, Czech republic, Finland, Hungary, Latvia, Lithuania, Malta, Estonia, Greece, Portugal, Cyprus, Slovenia, Sweden, South Korea, Indonesia, Taiwan, South africa, Thailand, Belgium, Hong Kong, Ireland, Netherlands, Poland, Spain, Italy, Austria, Israel, New Zealand, Philippines, Singapore, Switzerland, Norway, Saudi arabia, Ukraine, United arab emirates, Qatar, Kuwait, Bahrain, Croatia, Malaysia, Chile, Colombia, Costa rica, Dominican republic, Panama, Trinidad and tobago, Guatemala, El salvador, Honduras, Jamaica.